If you're expecting guests for dinner, then consider serving one of the impressive beef dishes featured in this collection. You'll find very simple roasts that only take a few minutes to prepare, as well as more complicated dishes that are well-worth the extra time. 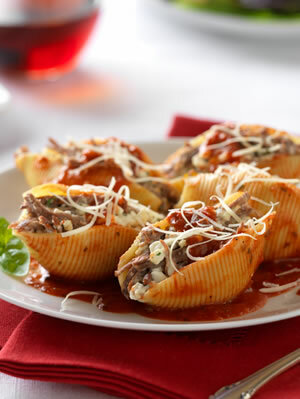 The Italian Beef Stuffed Shells Marinara, for example, takes a little more effort - but it may end up being one of your most requested dishes for years to come. Beef is one of the most available sources of protein, and provides many important nutrients such as iron, zinc, and B vitamins. Did you know that vitamin B6 and vitamin B12, which are among the B vitamins found abundantly in beef, have a strong role to play in the prevention of diabetes-related complications? It's true. Neuropathy, the severe damage caused to the nervous system by high blood sugar levels, has been associated with deficiency of vitamin B6. Vitamin B12 may also have a strong role to play when treating diabetic neuropathy - it's necessary for the correct functioning of nerve cells, which may help reduce nerve damage. Unfortunately, Metformin, which is the first-line drug of choice for the treatment of type 2 diabetes, inhibits the absorption of vitamin B12. So much so that 30% of diabetics suffer from a vitamin B12 deficiency because of it. The good news is that just one serving of beef can provide about 50% of the daily recommended value of B12 and 25% of the daily recommended value of B6. All the recipes featured below include complete nutritional information to help make your meal planning easier. Now - on to the recipes! Marsala sauce is added in the roasting pan for super-tender results. The compote comes together easily while the roast is cooking. Heat oil in large nonstick skillet over medium heat until hot. Place beef roast in skillet; brown evenly. Remove roast from skillet. Place on rack in shallow roasting pan. Season with salt and pepper, as desired. In same skillet, add shallots and garlic; cook and stir 1 to 2 minutes. Add Marsala; cook and stir 6 to 7 minutes or until reduced by half. Add broth and parsley; bring to a boil. Pour into roasting pan around roast; brush surface of roast with broth mixture. Insert ovenproof thermometer so tip is centered in thickest part of beef, not resting in fat. Do not add water or cover. Roast in 425F oven 35 to 45 minutes for medium rare; 45 to 50 minutes for medium. Baste with cooking liquid halfway through roasting. Pour pan drippings into small saucepan; bring to a boil. Stir in cornstarch mixture; cook and stir 1 to 2 minutes or until thickened. Remove sauce from heat. Set aside. To prepare Shiitake-Leek Compote, slice leeks crosswise into 1/2-inch thick slices. Melt 1-1/2 teaspoons butter in large nonstick skillet over medium heat. Add leeks; cook, covered, 10 minutes, stirring halfway through cooking. Stir in sauce; cook until heated through. Remove from heat; stir in 1-1/2 tablespoons butter, salt and pepper. This dish for Italian Beef Stuffed Shells Marinara takes a little effort, but it may end up being one of your most requested dishes. It is also easily doubled, so it can be considered for a gathering or holiday dinner. Preheat oven to 375F. Prepare pasta shells according to package directions; drain. Set aside. Shred beef pot roast with two forks. Bake in 375F oven 20 minutes or until heated through. Remove foil; sprinkle with remaining 1/4 cup cheese. Bake, uncovered, 5 to 8 minutes or until cheese is slightly browned and sauce is bubbly. Season with pepper and garnish with basil, if desired. Rubs are an popular way to season a roast. Not only does it add flavor, but it creates a coat that helps seal in moisture and adds texture. Combine salt, 1/2 teaspoon basil, oregano and pepper; press onto beef roast. Place roast on rack in shallow roasting pan. Insert ovenproof meat thermometer so tip is centered in thickest part of beef. Do not add water or cover. Roast in 325F oven 1-1/4 hours for medium rare doneness. Remove roast when meat thermometer registers 135F. Combine remaining ingredients, except tomatoes, in large bowl; toss. Place on rack in pan. Roast in 425F oven 15 minutes or until tender. Add tomatoes; toss. Carve roast. Serve with vegetables. Cooking food for a long period of time in an amount of liquid, covered, is known as braising. Braising usually involves a large piece of meat that is browned in some oil or fat before being combined with liquid and cooked either on the stovetop or in the oven. Add 1-1/2 cups water and vinegar to Dutch oven; cook and stir until brown bits attached to pan are dissolved. Return pot roast. Add onions, shallots, dates, salt and pepper; bring to a boil. Cover tightly and cook in 325F oven 2-1/4 to 3-1/4 hours or until pot roast is fork-tender. Cook liquid and vegetables over medium-high heat to desired consistency. Carve pot roast. Serve with sauce. Beef Tenderloin is the most tender cut of beef available. It is lean and boneless and is sold as a whole roast or a smaller center-cut roast. This roast also meets government guidelines for lean. Cut about 1/4 inch off top of garlic head, exposing cloves. Remove outer papery skin, leaving head intact. Place in center of 12-inch square heavy-duty aluminum foil; drizzle with 1 teaspoon oil. Bring two opposite sides of foil over garlic; seal with double fold. Fold in open ends to seal. Covmbine remaining vegetables, remaining 2 tablespoons oil, 1 teaspoon Italian seasoning and 1/2 teaspoon black pepper in large bowl; toss to coat. Combine remaining teaspoon Italian seasoning and 1/2 teaspoon pepper; press evenly onto all surfaces of beef roast. Place garlic, potatoes and onions on rimmed baking sheet. Roast tenderloin in 425F oven 45 to 55 minutes for medium rare; 55 to 65 minutes for medium doneness. Roast garlic, potatoes and onions 30 minutes. Add tomatoes and zucchini to pan; continue to roast 15 minutes or until vegetables are tender. Squeeze garlic pulp over vegetables; stir to combine. Sprinkle with 1/4 cup cheese, as desired. Carve roast; sprinkle with remaining 2 tablespoons cheese. Serve with vegetables. Choose mushrooms that are firm and evenly colored, with tightly-closed caps. If all the gills are showing, the mushrooms are past their prime. Before using fresh mushrooms, wipe them with a damp paper towel. Don't soak them, because they absorb water and will get mushy. Spray same pan with cooking spray and heat over medium heat until hot. Add mushrooms, onion and garlic; cook and stir 4 to 5 minutes or until tender. Add wine; cook and stir 3 minutes. Stir in sauce. Return steaks to skillet; bring to a boil. Reduce heat; cover tightly and simmer 1-1/4 to 1-3/4 hours or until beef is fork-tender. Top Sirloin is one of the most versatile cuts of beef. It is lean, well-flavored, juicy and tender. It is also a lean cut according to USDA guidelines. Preheat oven to 325F. Press seasoned pepper evenly onto all surfaces of beef roast. Place roast, fat-side up, on rack in shallow roasting pan. Insert ovenproof meat thermometer so tip is centered in thickest part of beef. Do not add water or cover. Roast in 325F oven 60 to 75 minutes for medium rare to medium doneness. Meanwhile, combine cheese, butter and green onion in small bowl until well blended; set aside. Spray large nonstick skillet with nonstick cooking spray; add Broccolini, onion and water. Cover and cook over medium-high heat 3 minutes. Remove cover and continue cooking 2 to 4 minutes or until water has evaporated and Broccolini is crisp-tender and lightly browned, stirring frequently. Remove from heat. Immediately add 2 tablespoons blue cheese mixture; stir until butter is melted. Season with salt and ground black pepper, as desired. Keep warm. Carve roast into slices; season with salt, as desired. Serve with vegetables and remaining blue cheese butter. If you cannot find rutabaga, then you can try turnips or parsnips instead. Heat oven to 350F. Place roast, fat side up, in shallow roasting pan. Insert ovenproof meat thermometer so tip is centered in thickest part of beef, not resting in fat or touching bone. Do not add water or cover. Roast 2-1/4 to 2-1/2 hours for medium rare; 2-3/4 to 3 hours for medium doneness. Meanwhile, place carrots, rutabaga and water in medium saucepan. Cover and cook over medium heat 13 to 15 minutes. Combine butter, brown sugar, lemon juice, lemon peel, dill weed and 1/4 teaspoon salt in small pan; cook over medium heat 2 to 3 minutes, stirring occasionally. Add butter mixture to vegetables; continue cooking, uncovered, 3 to 4 minutes or until vegetables are glazed, stirring occasionally. Carve roast into slices; season with salt and pepper, as desired. Serve with vegetables. Using already prepared and trimmed baby carrots and Brussels sprouts makes preparation even easier for this dish. Remember how to make this mustard sauce because it's easy to make and you can use it in other beef or pork dishes. Combine 3 tablespoons Dijon-style mustard, 1 tablespoon thyme and 1/2 teaspoon pepper in small bowl. Spread mustard mixture evenly over all surfaces of beef roast. 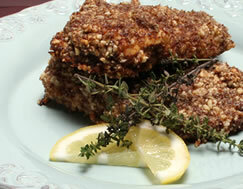 Press bread crumbs evenly onto roast over mustard. Roast in 325F oven 1-3/4 to 2 hours for medium rare; 2-1/4 to 2-1/2 hours for medium doneness. Meanwhile prepare vegetables. Cut shallow "X" into bottom of each Brussels sprout. Toss Brussels sprouts, carrots, oil, thyme, salt and pepper in large bowl. Transfer to metal baking sheet. Cover tightly with aluminum foil. Roast in 325F oven 1 to 1-1/4 hours or until crisp-tender. Uncover baking sheet; continue roasting 5 minutes or until lightly browned. Meanwhile prepare Mustard Sauce. Heat oil in small saucepan over medium heat until hot. Add shallots; cook and stir 3 to 5 minutes or until tender. Add Dijon-style mustard, mustard seeds and dry mustard; cook and stir 30 seconds. Remove from heat; stir in lemon juice until well blended. Add sour cream, parsley and pepper; stir until smooth. Keep warm. Carve roast into thin slices. Serve with vegetables and Mustard Sauce. Additional Credit: "Beef Tenderloin Marsala with Shiitake-Leek Compote" recipe and photo as seen in The Healthy Beef Cookbook, published by Houghton Mifflin Harcourt. Three-Mustard Beef Round Tip with Roasted Baby Carrots and Brussels Sprouts appears courtesy of The Healthy Beef Cookbook, published by John Wiley & Sons. 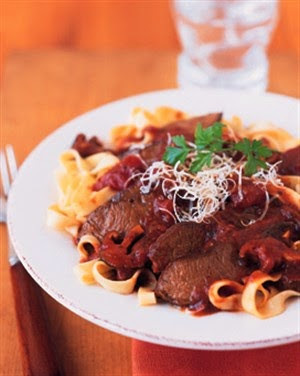 Various recipes and images appear courtesy of The Beef Checkoff.